For the past two months, approximately, I've been a renegade, a scofflaw, one of those in-the-shadows ne'er-do-wells secretly destroying... Scotch broom. My day job has me plunked smack-dab in the middle of the hundred acre wood, replete with gravel access roads sprinkled about. I've worked at this site for a little over eight years now, and I've run and biked these gravel paths so many times I could likely do it in my sleep. Who knows, maybe I have. A trip around the perimeter, door-to-door, is about 5.7 miles total, by the longest route. That gives you an idea of just how much land we're talking about here. I've been spending some time cutting new trails into these pristine (haha... more on that in a bit) forests, to the tune of up to 30 minutes a day on days I ride out there. It adds up. 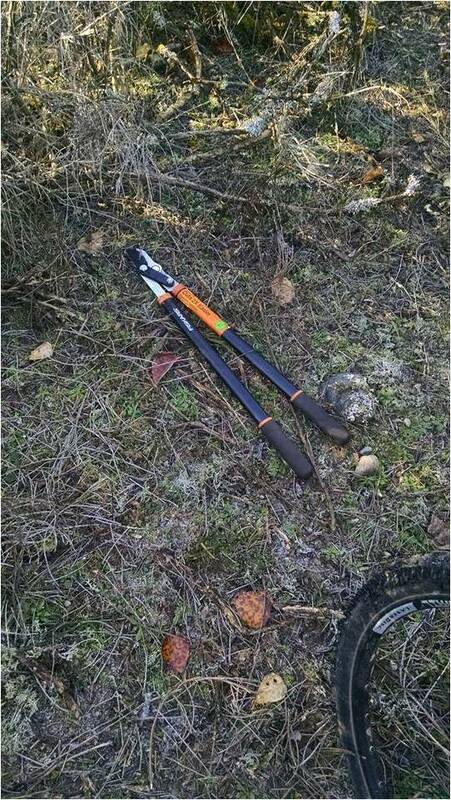 Leaving a set of long-handled brush cutters at the end of the current under-construction trail helps in not having to carry them out each day. That might be considered bad form, and could attract some unwanted attention from those who would have this shut down in the name of the current bubble-wrap-think (safety, they call it). So far I've been mostly cutting down Scotch broom, that insidious weed which was imported to help stabilize disturbed soils around highway construction sites. It will grow in anything, including the glacial till which comprises the majority of the site. All it took was the construction of two very large warehouse-like manufacturing buildings, and moving the "soil" across these hundred acres (okay, I don't really know just how many acres this site owns, but it's big), and there you go -- forests of alder, cottonwood, and Scotch broom. So these areas have had maybe 20 years to overcome the stripping, while others have what looks to be an older, truly untouched forest growing. I've put in much of this work basically widening deer trails. One trail is a fairly straight and flat traverse that I'd been looking at for a good four years, thinking it would connect through easily. And there are some great spurs I have planned to increase the trail network there. Another one tops a HUGE rock pile (also covered with cottonwoods and Scotch broom) and meanders through the flats. 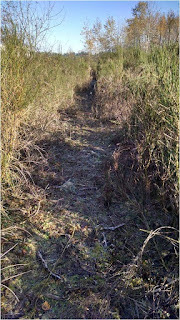 In all I've cut in over a half mile of new single-track. It's like installing a new swing-set at the playground. The plan is for much, much more, just adding a little bit at a time, on the sly. Poaching the land to add trails.